Fruit of the Loom advertises its Men’s Breathable Boxer Briefs in a hilarious new commercial. 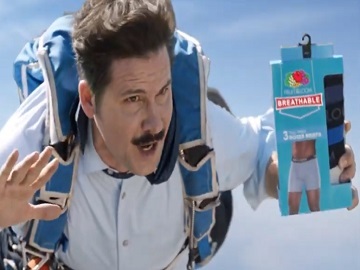 The 30-second spot, dubbed “Parachute,” features two men as they jump out of a plane and have a conversation about underwear while they are skydiving. One of them tells his fellow, Danny, that his Fruit of the Loom boxer briefs are breathable because it has tiny holes in the fabric “to allow air flow and keep you cool”. Asked if tiny holes really make that big of a difference, he then reveals he put a bunch of tiny holes in Danny’s parachute. “Huh, air really does get through there. Thanks for such a contextual demonstration,” Danny says before landing. As the spot ends, it turns out he didn’t land so well. He is now fully covered in cast, on a hospital bed. The commercial ends with the voiceover introducing the brand’s Men’s Breathable Boxer Briefs. Made from cotton mesh fabric that promotes air flow preventing you from getting hot, the Fruit of the Loom Breathable boxer briefs feature moisture wicking technology which distributes sweat away from the skin, keeping you dry throughout the day. One men’s breathable 3 pack assorted color boxer brief costs $15.99. The brand has also pitched its other products, including the Everlight underwear, which “is so light, you won’t even notice you’re wearing it,” the activewear range for men, which provides long lasting wicking and odor protection thanks to the Dual Defense technology, the breathable underwear for men and women, which is “So incredible you’ll want to talk about it,” and more.